I rocketed my bubble-gum mech suit, primed to blow up in a few seconds, behind Reinhardt’s seemingly impenetrable shield. The match was well into overtime and we were so close to winning just by keeping the other team from pushing their payload to the objective location. Running away with a second to spare, I watched as my suit took out the foolish robot knight, as well as a rival or two. I’m okay with calling myself a casual when it comes to anything resembling competitive multi-player gaming or first-person shooters in general. My first foray into these games was Team Fortress 2 but as someone who had no experience either competitive game play or the FPS genre, the fun was very short-lived. I did quite a bit of player-vs-player gameplay in World of Warcraft, but it left me after a while with anxiety problems regarding my skill and fairly traumatized by other players being gross. That put my desire to play against other gamers to bed for a very long time. When Overwatch finally debuted with a fully animated teaser trailer at Blizzcon in 2014, I had to know more. When I found out it was going to be a team-based first person shooter, my heart fell. Why would Blizzard put all of these colorful characters that I was already falling in love with into a game that was flatly competitive? Still, I made an agreement with myself to at least give it a fair shake; I had had fun in TF2 for a time, so I could enjoy Overwatch for a little while, right? Overwatch is what I’d consider a spiritual successor of TF2 in some ways, and it’s clear that Blizzard took design cues from that game. 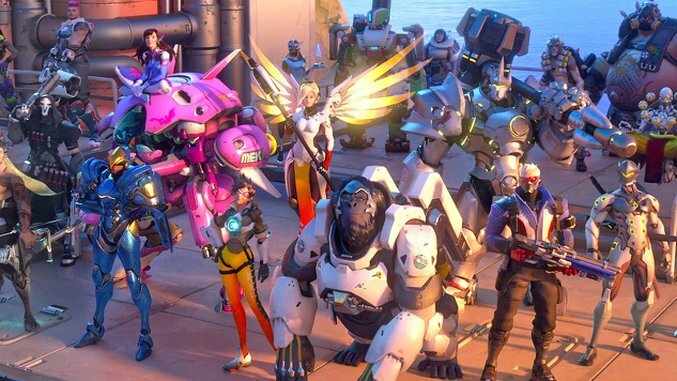 With Overwatch, they’ve done what has become their trademark in the past couple of years with all of their franchises: taken a very popular game genre and made it sleeker and friendlier to attract a wider audience. Hearthstone and Heroes of the Storm did this for online collectible card games and MOBAs, scooping up masses of gamers who may have never played a game in that vein before. The game takes the team shooter format and removes some of the parts that might be off-putting to newer players to FPSes (including reducing player toxicity) and adds in more hand-holding and fun, crunchy bits that would entice people to play over other games in the traditional format. There’s a colorful poppiness to the characters and environment design, even if most of it is whizzing by you as breakneck speed when you’re actually down in the trenches fighting other players. Blizzard wants you to care about the world you are playing in and the characters are part of that equation, even if the game itself is kill-or-be-killed. Whether it’s the giggly sounds of Tracer blinking around a map, the sepia-toned victory shot at the end of the Hollywood map or even Mercy’s signature golden robot-wings and halo, everything feels fun instead of murderous or gory. It takes the sting out of a loss if you ultimately love the places and people you are playing a part with. I always feel like I’m running around a place I’d love to visit, sort of like sneaking into an amusement park after dark with my friends. It hearkens back to the parts of doing battlegrounds in Warcraft that I did like: that I was defending a beautiful and important place, versus merely destroying people amid wooden boxes. The matches themselves are also very short and feel less punishing in how they play out in general. Most matches are under the 10-minute mark, meaning you can queue up for quite a few in a short amount of time and not feel like you wasted too much time if you lose. Feeling burned out very quickly due to being overwhelmed or sinking a ton of time into what is essentially a losing match always made me feel terrible, that I helped get so far with my team but only to lose. Finally, I think one thing that most people overlook when it comes to getting newer players into the game is not the size of information to be taken in over the course of learning a game but how that information is persistently and transparently communicated to the player. The user interface of Overwatch is one of the best things about it, giving you the things you need to know in a bright, simple way. Your ultimate ability fills up in a big circle dead center of your screen, things like a running kill ticker are relegated to top corner right and match progression is big letters in your eyeline. The game also consistently uses clear and colorful visuals to convey what you should be doing in a match. Map objectives are given glowing routes to get you to them start-of-match and even give you visual reminders about where to go to attack or defend, which can make it easier for players who might get lost to make sure they are where the action is. Objectives are often bounded by a big glowing box as well. Blizzard’s crown jewel when it comes to information has to be the sound design, in this respect: you can tell who is around you by what barks and effects you hear. Any player who has been in at least one or two matches knows that it’s time to run if they hear, “It’s High Noon.” Giving players a way to understand that danger might be nearby without having to devote another bit of visual data to it is where this game shines and helps any new player process the moment-to-moment of the fighting. I found out later that ultimate abilities even have a difference between friendly and enemy barks, helping you delineate who is casting something spectacular — though in my case, D.va’s self-destruct will hurt friends as well as foes. I may have, on several occasions, taken out several of my teammates instead of just myself. But it’s alright, if we’re all having fun. C’est la vie, as Widowmaker would say. It can’t really be stated enough how all of these distinct pieces within both the gameplay and the game world made made feel like I finally had a place within competitive gaming, even if I am on the casual side. I feel like a hero when I play my favorite characters and I get choked up at the idea of helping my team. Inclusivity and positivity hide behind some intelligent, pared-down game choices and in doing so, Blizzard has spun an engaging fantasy around this idea that if we all just try, then that’s good enough. Maybe it doesn’t matter if I’m the best player, as long as I try to be better. In a world full of games where being the best is the only space to occupy, Overwatch at least tries to create a new and better future for the rest of us. Nico Deyo is a feminist media critic and curmudgeon who lives with in the Midwest. She self-publishes at her blog Apple Cider Mage, and can be found on Twitter at @appleciderwitch.